A group of brewing students from Italy has come to Kwantlen Polytechnic University to learn the art of craft brewing the Canadian way. The 25 students arrived in Vancouver in early February and will be receiving 12 weeks of training at KPU’s brew lab in Langley. During their training they will also be touring the Lower Mainland’s craft breweries and exploring Canadian craft beer culture. KPU brewing instructor Alek Egi says that many of the students have plans to start their own breweries back home and have come to Vancouver to learn skills that will give them an advantage in Italy’s emerging craft brewing industry. Over their time at KPU, the Italian students will receive 96 hours of training in both the classroom and the brewery. The students will have the opportunity to brew two different types of lager and two different types of ale from start to finish. The brewing program has also organized tours at local breweries including Parallel 49 and Trading Post. 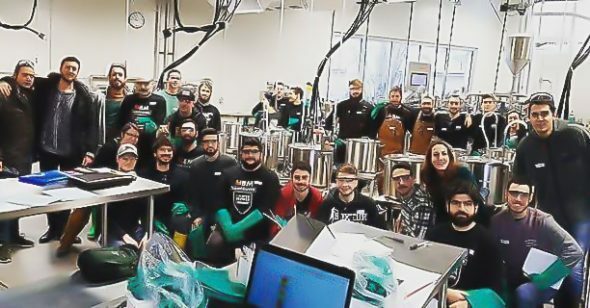 Even in North America, KPU’s brewing lab is a unique facility, as there are not many other breweries designed specifically for teaching. Egi says that it’s also the chance to learn from an established craft microbrewing industry—something that’s only beginning to be replicated in Europe—that makes the experience one of a kind for the Italian students. B.C.’s craft brewing industry has exploded over the past 10 years and has begun to develop a reputation internationally. Egi says that one of the first things that brewers from abroad tend to notice about the local craft brewing industry is the focus on innovation and experimentation with new styles of beer. “The big difference between Europe and North America is tradition versus a new world approach where anything goes and people are not afraid to try new things,” says Egi. Christopher Paiewonsky, one of the Italian students visiting KPU, developed his passion for craft beer at 16, when a pub near his home in Rome began offering craft beer. Craft beer was a rarity in Italy at the time, but Paiewonsky quickly developed a passion for the suds. He began traveling around Europe to try different beers in the Netherlands, England, Germany, and elsewhere. Later, he became a chemical engineer and started homebrewing with two of his colleagues. He came to KPU in February to refine his craft. Like the other students in the program, Paiewonsky says that his first few weeks in Vancouver have been spent exploring the city, visiting as many breweries as he can, and trying as many beers as possible. He says that he was surprised to see so many European styles replicated by Canadian brewers in addition to new styles that can’t be found back in Europe. The standout brewery for him so far has been Storm Brewing in East Vancouver but says that, so far, his favorite beers have been a sour—a style not found in Italy—from Brassneck Brewing and an IPA by Steamworks Brewing. In addition to being inspired by the breweries, Paiewonsky has been impressed with the amount of live music to be found at Vancouver bars, which he says is rare back in Rome. Over the coming weeks he’s looking forward to exploring the North Shore mountains and rainforests as well as planning trips to Vancouver Island, Portland, and Seattle. The program is still in its first few weeks but both students and instructors say that they’ve been very happy with the experience so far. Egi says that he would like to see more groups of international students, regardless of where they come from, enrol in his brewing program.